Cundiff's mural is on the back of the former Poppleton Electric & Machinery Co. building in Georgetown. Craig Cundiff says he knows the effects of climate change all too well. The New Orleans native relocated to Seattle a few years after Hurricane Katrina devastated his hometown. Part of Seattle’s appeal was the ability to live in the city without owning a car. For the visual artist, ditching the automobile was more of a money saver than exhibition of environmental wokeness. Still, there’s a slight hint of pride in his voice when he mentions being car-free for more than a decade. Cundiff’s work never has never been especially politically, often dealing in abstract portraiture instead. (His “hipsters” series, in particular, is a colorful blast.) But something clicked at the end of this summer. Hurricane Harvey had just rocked Houston, while Irma and Maria were circling in the Caribbean. The wildfires roiling across the Northwest left Seattle blanketed in a smoke thicker than the soot that accumulates on Cundiff’s windows from Rainier Avenue traffic. “It’s definitely something we have to live with every day, cleaning this soot and the smog off our windows,” he says. The 32-year-old was already mulling ideas for a mural contest held by Coltura, a Seattle-based organization aimed at weaning America off gasoline, when his son asked to go to the beach. Because of the wildfires, Seattle was under an air quality watch and Cundiff had the challenge of explaining climate change to a 4-year-old who just wanted to play at the beach. 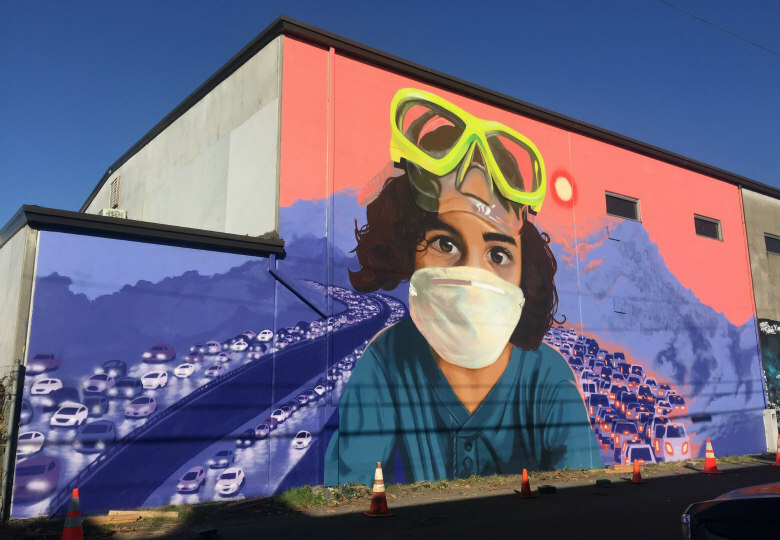 His son already had his beach goggles in hand and they grabbed an old dust mask lying around for an impromptu photo shoot that became inspiration for Cundiff’s striking new Georgetown mural. The nearly 2,100-square-foot painting, dubbed “My Child, Our Air,” was unveiled on the Vale Street side of the old Poppleton Electric & Machinery Co. building (969 S. Nebraska St.) last weekend. The sprawling mural depicts his son, face covered by the mask and goggles, in front of a familiar scene of gridlocked Seattle traffic. The hazy orange sun from those wildfire days looms above the snarled highways engulfed in smoke. Its placement in industrial Georgetown is no accident. Home to Boeing Field and industry along the Duwamish River Valley, South Seattle in general has been disproportionately affected by air pollution. ("Even right now there's probably a bunch of semi-trucks parked around the mural," Cundiff quips.) Asthma rates, which are known to be triggered or worsened by air pollution, are more than 30 percent higher in South Park than the citywide average. Cundiff’s first activist-driven piece may not be his last. The idea of art-with-a-message working toward “some sort of better place” was rewarding, he says. Especially with an issue near and dear to his heart.